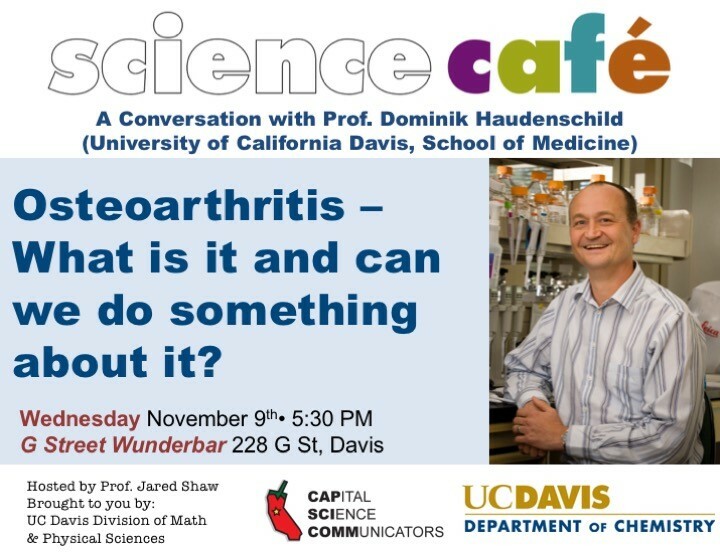 If you are in Davis tonight, I’ll be at the Science Cafe for an interactive conversation about our research at the UC Davis School of Medicine, Department of Orthopedic Research, on the topic of “Osteoarthritis – what is it and can we do something about it?”. The Science Cafe in Davis is hosted by Prof. Jared Shaw, and held at the G Street Wunderbar at 228 G Street in Davis. It will begin at 5:30pm. More information on the Davis Science Cafe series. Science Cafés are events that take place in casual settings such as pubs and coffeehouses, are open to everyone, and feature an engaging conversation with a scientist about a particular topic. Science Cafés represent a grassroots movement. … Venues range from a local library or coffee house to a neighborhood bar. More information about Science Cafes at the national level. Our lab had its first patent issued, to the Regents of the University of California. A few years ago we discovered that the extracellular matrix protein COMP binds to growth factors of the TGF-beta superfamily. This binding enhances the activity of the growth factors. Scientifically this is exciting! Although it’s been known for 50+ years that BMPs require extracellular matrix for their bone forming activity, we still don’t really know why this is the case. With our discovery, we can start to dissect the BMP-COMP interaction and begin to understand why exactly the growth factors require extracellular matrix for their activity. We also expect that this will have commercial potential. BMPs are a $2 billion dollar industry, their clinical importance is in helping to form bone. Examples are in spinal fusion surgeries, long bone fracture non-unions, and dental applications. One of the factors limiting clinical BMP use is how inefficient the current BMP formulation is. In fact, physicians often apply 12 to 24 milligrams of BMP in spinal fusion surgeries. Endogenous (naturally occuring) BMP is active in the nanogram range, up to a million times less than what is used clinically! 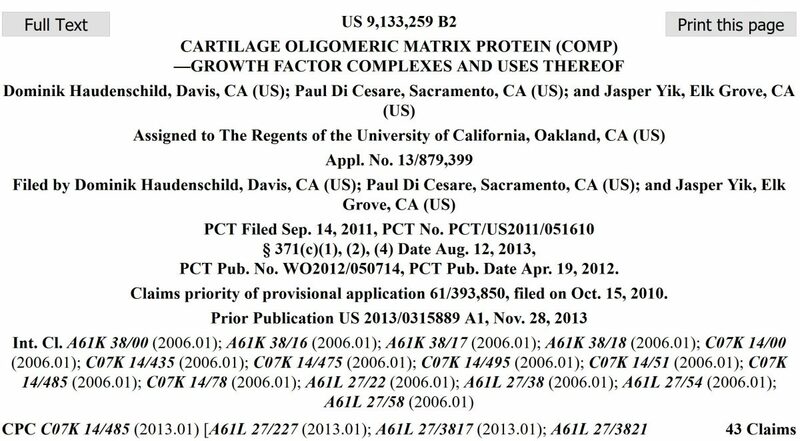 Our patent covers the use of COMP as a carrier or scaffold for the BMP and TGF-beta growth factors, to enhance their activity in bone and cartilage repair. The University of California has a generous patent policy, publicly available here. In our case, UC paid for the entire patent application process. If the patent generates revenue, UC will first recover the patent filing costs. After that, 35% of the net royalties and fees are paid to the inventors, and another 15% returns to the campus or laboratory to fund research. Jeffrey Lu was recognized for his teaching and at the 2016 Graduate Studies Honors and Awards Ceremony, which recognizes graduate students for their outstanding achievements in the areas of teaching and research. This is truly an achievement, the last time such an award went to a student in the Biomedical Engineering Graduate Group was in 2008! Jeff also co-authored two papers on chondrocyte mechanotransduction, in PLoS-ONE and Tissue Engineering. 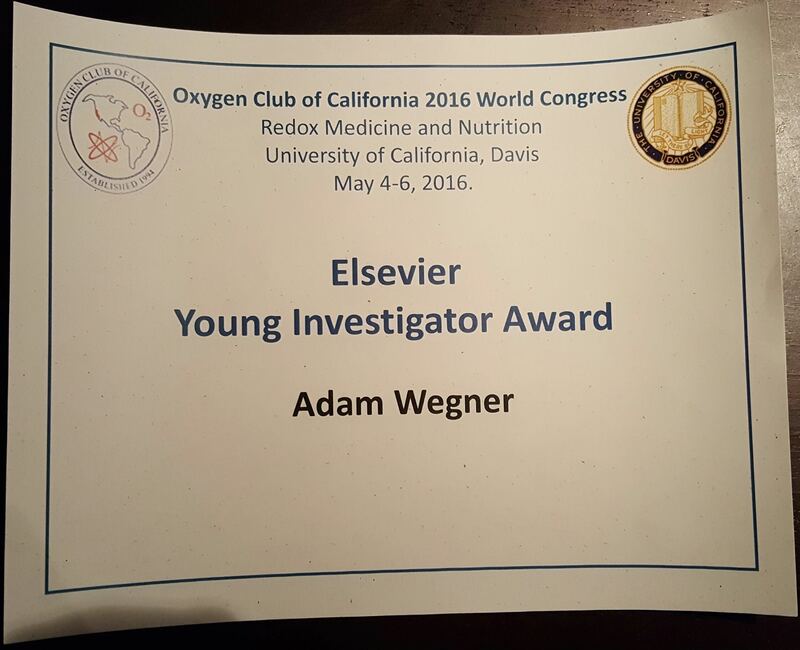 Congratulations Young Investigator Adam Wegner! Adam was awarded the Elsevier Young Investigator Award for his work on the role of Nox4 in post-traumatic osteoarthritis. The award was given for his presentation at the Oxygen Club of California 2016 World Congress on Redox Medicine and Nutrition. Nox4 is an enzyme that creates hydrogen peroxide, a very important short-range signaling molecule for maintaining bone and cartilage health. Adam is currently a 3rd year resident in the UC Davis Department of Orthopaedic Surgery, and took an extra year to work on the Nox4 project. Attending the 2016 OARSI Meeting in Amsterdam! 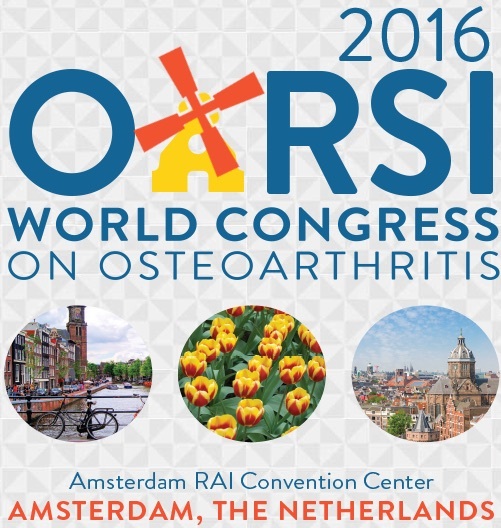 We’re honored and excited to present our research at the 2016 OARSI meeting on osteoarthritis in Amsterdam later this week! Our contributions to this meeting include a talk on joint responses to biomechanical impacts, and how biological adaptation to such impacts might help initiate osteoarthritis. We also have a poster in collaboration with Lin Han’s group at Drexel, showing that loss of cartilage integrity after ACL rupture injury is in part mediated by cellular responses to the injury, rather than the the mechanical effects of the impact itself. Beyond the great mission statement quoted, this is an organization which has impressed me personally with its vision, focus, and effectiveness. And the way they include a local icon into their meeting logo – this year it’s a windmill.